It's the most wonderful time of the year, Steam Sale time! Yes folks you heard that right, It's time for Steam to launch their annual Steam Winter Sale. Much like the other Steam sales, the Steam Winter Sale is notorious for providing gamers with unbeatable deals on some of the hottest titles from that year, but it is also notorious for emptying out wallets in the blink of an eye. Although Steam haven't officially announced the date that the sale is slated to begin, new leaks from PayPal suggest that the sale will begin on December 22nd, 2015 or in other words, Tuesday. You may be wondering, how the heck did a company like PayPal leak the Steam sale? Well if that's the case then you would probably be surprised to hear that this isn't the first time this has happened. 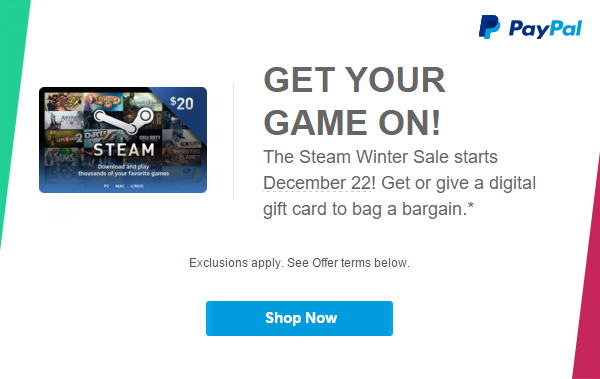 Earlier today PayPal put up a banner image on their site that was promoting users to give or get a digital gift card to use during the Steam Winter Sale, which in turn also revealed the date that it was slated to begin. Now this shouldn't be taken very seriously since it isn't an official announcement, but About a month ago, PayPal sent out an email that was intended to encourage users to purchase Steam Wallet cards for the upcoming Steam Fall Sale, and in that email they listed off the date that the sale would begin and it turned out to be correct. An end date was not given in the PayPal banner, but the sale is expected to run for at least a week, maybe even more if it decides to extend until the new year. What do you think? Are you prepared for the sale? More importantly, is your wallet prepared for the sale? Leave your thoughts and comments below!